Come on down to sunny Miami for the annual Miami international Boat Show. 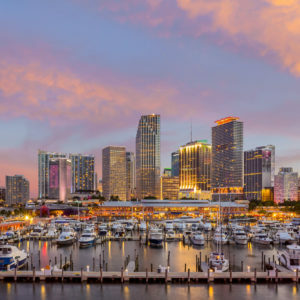 This year, the event, produced by the National Marine Manufacturers Association will be held February 14-18, 2019 at the Miami Marine Stadium Park and Basin. Getting to the venue is easy with free water taxis and shuttle buses along with well connected public transport. Plan a weekend getaway with your special valentine with plenty of activities both on and off the water for you and that special someone. Tickets are on sale now. Magnum Marine is also excited about our newest boat, the Magnum 27′ which will debut after the show with expected completion Spring 2019. Stay tuned for more information about this new release from Magnum that will be coming soon! Click here to see all models offered at Magnum Marine.